Faced with a lionfish invasion, some researchers, divers and restaurant owners from Carteret County decided to fight — and bite — back. Lionfish are invading the Atlantic Coast of both North and South America, including the coast of North Carolina. Photo courtesy of NOAA. “We were trying to make lemonades from lemons,” says Janelle Fleming, a member of the Eastern Carolina Artificial Reef Association. Fleming, who also is an oceanographer with Seahorse Coastal Consulting, received a minigrant from North Carolina Sea Grant to test an idea of how to catch the fish. The team included members from Bistro-By-The-Sea, Discovery Diving, the National Oceanic and Atmospheric Administration, and Seahorse Consulting. They collaborated on a pilot study to test traps to capture lionfish and conduct a consumer taste testing for the fish. The traps were designed to maximize capture of the invasive species, not of other marine animals in the area. “This project was successful because of the participation among private industry, academia and NOAA,” notes John Fear, Sea Grant deputy director. The team attracted and caught lionfish using Maine lobster traps and crab pot Christmas trees. The latter was a novel idea from James Morris, a NOAA biologist. The research team saw this project as an opportunity to unite several local industries, including dive shops, commercial fishermen, restaurants and crab pot Christmas tree makers. Photo by Janelle Fleming. “Nobody’s ever done anything like this, so you’ve got to go with what people think might happen,” Fleming recalls with a laugh. For the second part of this project, the team conducted a lionfish tasting to determine if there could be a demand for this invasive species among consumers. Tim Coyne, executive chef of Bistro-By-The-Sea, prepared a two-course lionfish meal — a slider appetizer and baked entrée. He used recipes typically crafted for mild-flavored, white fish, such as triggerfish or grouper. See the recipes on page 36. 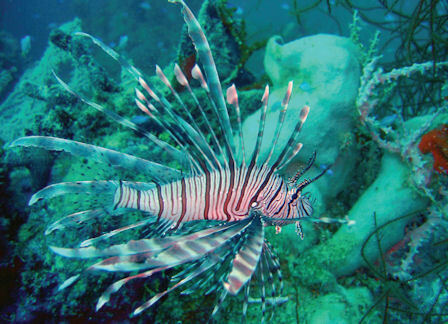 Forty-three participants were recruited to evaluate Coyne’s lionfish features. They had been involved in a similar series of sturgeon tastings in 2013, also funded by Sea Grant. Results were promising. Tasters rated the appetizer as “very good” for flavor, texture, aroma and appearance. They called the entrée “excellent.” Several praised the mild flavor of the meat and its flaky, firm texture. 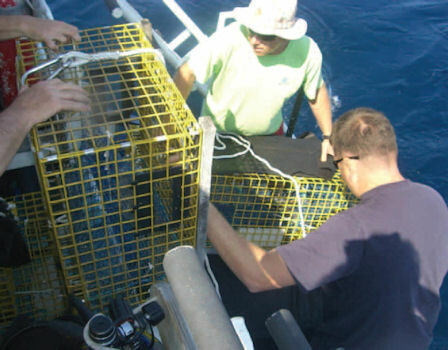 With this pilot test behind them, Fleming has ideas to use another kind of lobster cage, as well as traps shaped like reef balls, a structure that seems to attract lionfish. Underlying the team’s efforts to develop a commercial lionfish industry is a desire to help their neighbors. “We know that this has significant potential,” Fleming notes, predicting that these methods might catch sufficient lionfish to meet the demands of the restaurant industry in Carteret County, Raleigh and Charlotte. 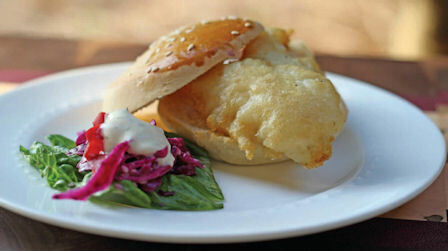 Tim Coyne, executive chef of Bistro-By-The-Sea, tested lionfish recipes, including this slider appetizer. Photo by Vanda Lewis. First, prepare the Asian slaw. Coat front and back of lionfish with tempura batter mix. Test oil by sprinkling a touch of batter. If the batter sizzles and rolls, the oil is hot enough. Turn down fryer one notch and carefully place lionfish in oil. Cook until golden brown. Place 2 lionfish portions on bottom of each bun. Top with a heaping tablespoon of slaw. Add one teaspoon of remoulade on slaw. Place top bun on slider. Assemble remaining sliders. Serves 4. Mix all slaw ingredients together. Salt and pepper to taste. Refrigerate for 1 hour prior to serving on lionfish sliders. Heat olive oil in skillet until smoky. Place leeks in skillet to heat, but do not brown. Add other vegetables and mix thoroughly. Remove vegetable mix from skillet and set aside to cool. Next, in food processor, add 8 ounces lionfish fillets, egg white and vegetable mix. Pulse until well blended. Place 4 lionfish fillets on greased baking sheet. Spoon equal amounts of mousse on top of each fillet. Top mousse with 4 remaining fillets and sprinkle with paprika. Bake for 20 to 25 minutes. While the fish is baking, prepare lemon-garlic scampi sauce. When fish is finished baking, place serving of stuffed lionfish on each dinner plate and top with warm scampi sauce. Serves 4. Heat large skillet over medium-high heat. Add butter to the skillet. Cook butter until foaming subsides. Raise the heat to high, add garlic and cook 1 minute. Add white wine and lemon juice. Boil the liquid until slightly thickened, about 30 seconds. Scrape up any browned bits from the bottom of the pan with a wooden spoon. Stir lemon zest and parsley into the sauce. Set aside and keep warm. This article was published in the Holiday 2015 issue of Coastwatch.